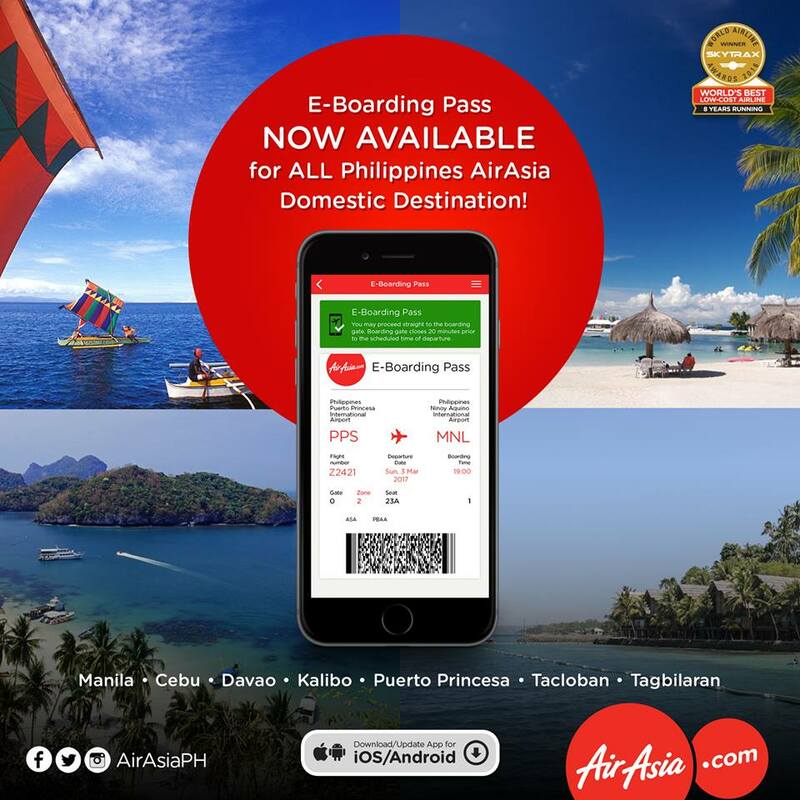 MANILA, 3 March 2017 – Enjoy the comfort of checking-in and boarding flights using your smartphones with AirAsia’s e-boarding pass now available on all domestic flights in the Philippines. AirAsia’s “E-Boarding Pass” is a paperless boarding pass that allows guests without check-in- baggage to proceed straight to the boarding gate without having to queue at the check-in counter or desk at the airport. Guests with check-in- baggage, however, are required to proceed to bag drop counter first before going to the boarding gate. To enjoy this convenience, guests have to download the AirAsia Mobile App in their smartphones and use this application to check-in and receive their e-boarding pass in their mobile phones. Upon boarding, guests will use their mobile phones to show their e-boarding pass instead of the traditional paper tickets. At the boarding gate, AirAsia’s guest service personnel will verify guests identity and scan their e-boarding pass. Guests may then proceed to the aircraft. Guests are required to present their e-boarding pass to the cabin crew before boarding the aircraft. E-Boarding pass is available on all AirAsia domestic flights departing from airports in Manila’s NAIA Terminal 4, Cebu, Kalibo, Davao, Tacloban, Puerto Princesa and Tagbilaran in the Philippines. It is limited to one guest in one booking only and is currently unavailable for international flights and Fly-Thru bookings or those with multiple flights. AirAsia offers several flights to and from Manila, Cebu, Davao, Tagbilaran/Bohol, Boracay (via Caticlan and Kalibo), and Tacloban. Flights from Cebu to Palawan, Boracay/Caticlan, Davao and Davao to Clark, Cebu, Boracay/Caticlan, and Palawan will commence on April 22. Find out more about AirAsia’s new products and exciting promotional fares at Facebook (facebook.com/AirAsiaPhilippines) and Twitter(twitter.com/AirAsiaPh).